When it comes to living healthfully, the pursuit is about both the journey and the destination. 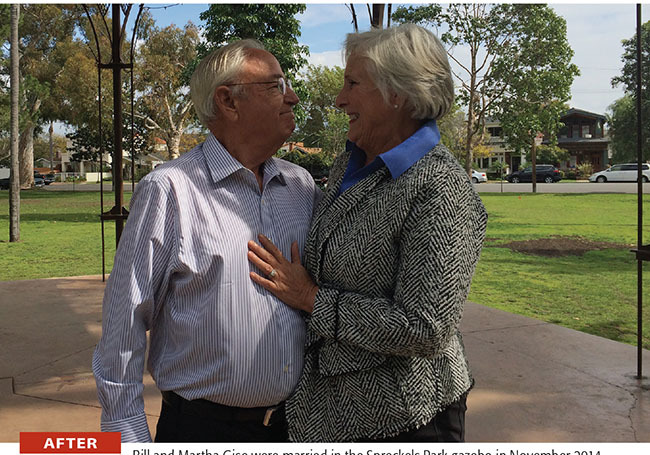 These Coronado locals have grabbed the bull by the horns and taken strides — quite literally — toward healthier, happier lives. And they’re loving the rewards every step of the way. Bill Gise was a widower of seven years when one of the many organizations he’s involved with, the Make-A-Wish Foundation, asked him to participate in their bachelor’s auction fundraiser. That night, Martha Kuenhold, a divorcee of 20 years who had not dated anyone since the split, bid on Bill and won a date with him for $200. “He took me for Chinese food at 99 Ranch Market for our first date,” Martha said as they both laughed. Then came the news of Martha’s daughter’s engagement and upcoming nuptials the following July in Iceland. The soon-to-be mother of the bride made it a goal to lose some weight for the wedding — and her new husband jumped on board. The couple began using the Medifast program, which entails five provided meals a day along with snacks and energy bars, and one meal they cook themselves. The couple eats a lot of fish, chicken and salads and they cut out most refined carbohydrates. “A lot of our success and the fact that it felt pretty simple and easy was because we support each other. We are in this together,” said Bill. Since they began the weight-loss program, Bill has shed 35 pounds and Martha has lost 20. 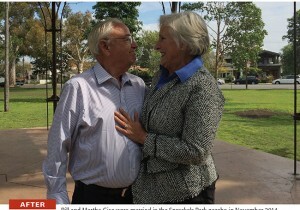 Bill and Martha Gise were married in the Spreckels Park gazebo in November 2014. The couple has since lost more than 55 pounds together through diet, exercise and a supportive partnership. Just over a year ago, Urtnowski, now 38, was convinced to try Bikram yoga at Coronado Hot Yoga. The practice involves a 26-posture series over the course of 90 minutes in a 104-degree room with about 40 percent humidity. After using his scooter as his primary mode of transportation for nearly two decades, Urtnowski’s legs had significantly atrophied. “I had my doubts,” he said. “But with a lot of modifications to the postures I found it to be doable. The series of poses really helps with circulation and, after some time, I began to see subtle changes in my legs.” Since beginning the practice, his legs have been able to support more and more weight. 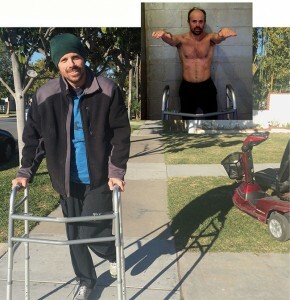 He’s now able to use a walker and even takes a daily walk along the street outside his home on A Avenue. His activities also include Pilates, swimming and biking. “It’s very empowering to take matters into your own hands and not rely on some magic pill or easy fix (which may or may not come) to cure what ails us. Part of me feels as though I wasted time looking for a cure when all along I had the ability to heal myself from within. 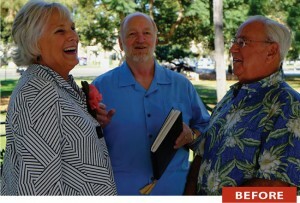 Growth comes from taking charge to better yourself and realizing there’s no better person to do it than you,” he said. Luke Urtnowski began practicing hot yoga just over a year ago in an attempt to gain strength back in his legs and find freedom from his mobility scooter. He’s since developed the ability to take daily walks and even complete exercises requiring significant leg strength, like wall sits (pictured in inset). When Jill Powell’s 16-year-old son left for a Rotary exchange program in Italy last June, his 100-pound chocolate lab, Bernie, was in need of a new walking buddy. So Powell strapped on her walking shoes and simply started out with her furry friend — and on their very first stroll together they went six miles. Powell found it refreshing and fun — a welcome part of her day that soon became ritual. And at home, she began making healthier eating choices (an easier feat now that she was no longer cooking for a teenage boy), such as eating more fish and salads and foregoing breads and pastas. Before long, she found herself walking four to six miles in the morning, and then venturing out again in the afternoon for another three to four miles — sometimes hitting as many as 12 miles in a day. Within the first three months of her new routine, Powell had shed 35 pounds. “Though my dog is very tired at the end of the day, I find I have so much more energy! I am addicted to walking — it’s something I look forward to doing every day,” said Powell. 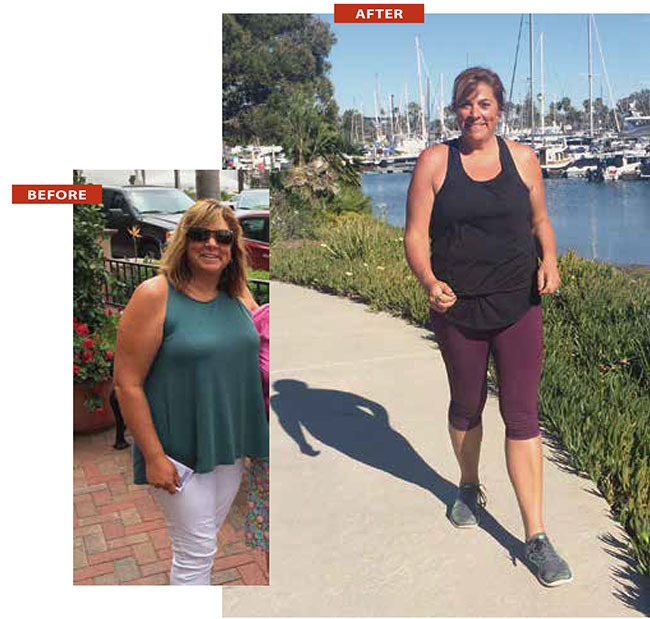 Last summer, Powell also began sailing sabot boats with an adult program at the Coronado Yacht Club, where she was pleasantly surprised by a motivating factor: “I could go a lot faster since I was skinnier!” she said. She also joined Coronado Fitness Club and began taking five classes a week there, including spinning, weight training and Zumba. Jill Powell started taking long walks last summer to give her dog some exercise. 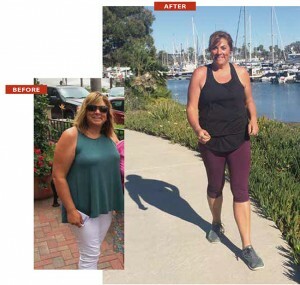 She now walks about 10 miles a day and has lost more than 50 pounds.